This mask is a one-of-a-kind museum piece that I purchased at the Abenaki reservation in Odanak, Quebec, in July 2005 from Marguerite Panadis, who was liquidating her store as a result of an illness that set in around 2000. It was made by Marijean Gill about seventy-five years ago (circa 1940). It hung in Ms. Panadis's store on the reservation for 30 years. The mask was old when Marijean Gill gave it to Ms. Panadis. It is called "Le masque de la bonne danse" in French or "The Mask of the Good Dance" in English. It is a good luck mask. Marguerite claims that it brought her good luck over the years at her store. It is now hanging in my home in Toronto. We cannot export this from Canada without getting a release for exporting cultural property. This can take up to a year to obtain. 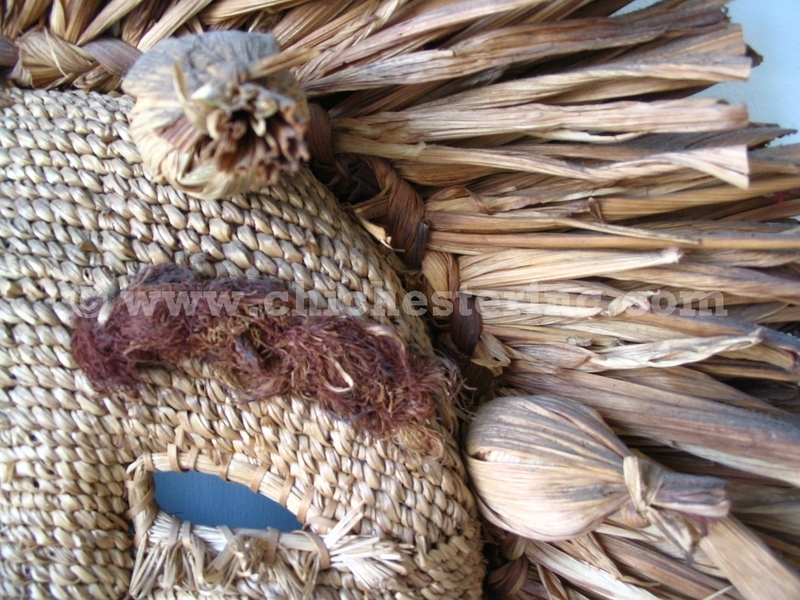 The mask was made using sweetgrass, ash splint, corn husk for the hair, and corn silk for the eye brows. The mask is in excellent condition. To the best of Marguerite's knowledge, there is only one other mask extant--at the museum in Odanak. This is a true collector's piece. Madame Gill showed about 10 people on the reservation how to make this mask, including her own daughter. None of them used what they learned to make the masks. 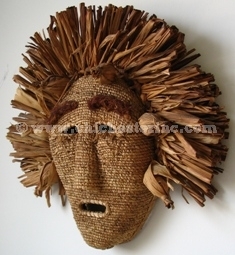 Madame Gill would not show Marguerite, a master basket maker, how to make this mask because she was afraid that Marguerite would make them and compete with her. Madame Gill died in the late nineties at around 80 years old. Note: The information in this webpage is from an interview with Marguerite Panadis by Paul Crosby at her home in July 2005. All pictures were taken by Paul Crosby and copyright is claimed. 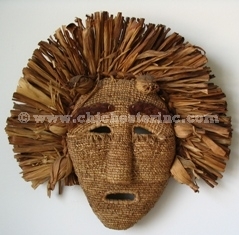 Click HERE for other Iroquois Masks. Click HERE for Corn Husk Masks.